The Book Rat: Excerpt: Pirates and Prejudice by Kara Louise + Winner's Choice Giveaway! Excerpt: Pirates and Prejudice by Kara Louise + Winner's Choice Giveaway! Do you ever hear a premise or title that is so delightfully ridiculous, you simply must have it? That is how I feel about the book I'm about to introduce: Kara Louise's Pirates and Prejudice. The idea of Mr Darcy being mistaken for a pirate... I can't tell you how deliriously happy that makes me. I'm grinning just typing the words, seriously. In this excerpt from “Pirates and Prejudice,” Darcy has to learn how to talk and act like a pirate, instead of the gentleman that he is. Because he resembles Lockerly, an escaped pirate, the authorities asked him to pose as the pirate, hoping to lure Lockerly to them. To clarify this segment, since Darcy is going to assume the identity of Lockerly, they have already begun calling him that. Darcy walked down the hall to the small dining room and found the three men already there. He greeted them with a nod of his head. Darcy sat down, deciding he would not speak unless spoken to. He placed the cloth napkin on his lap. By the time Darcy retired for the evening that first day, his mind reeled with everything the men had tried to teach him. The inarticulate din that had been coming out of his mouth caused him to shudder. But if he had hoped that having a diversion such as this would rid his mind – and his heart – of Elizabeth Bennet, he was mistaken. Every mention of ridding him of his gentleman-like behaviour made her accusation as fresh as if it had happened yesterday, not three months ago. After Elizabeth Bennet refuses Mr. Darcy's offer of marriage, it takes a heavy toll on him. He withdraws to London and disappears near the docks, away from family, friends, and acquaintances. When he is mistaken for an escaped pirate, he is thrust into an adventure he would never have imagined. Will this be what he needs to forget the one woman he had come to love? When her aunt and uncle have to cancel their plans to tour the Lake District, Elizabeth Bennet has the opportunity to sail to the Isles of Scilly with her father. After a pleasant visit, the voyage home brings storms, a shipwreck, and pirates! When she is rescued by gallant Captain Smith, she finds herself inexplicably drawn to him. What will she do when she discovers he is the very man whose offer of marriage she refused just a few months earlier? Kara has offered up winner's choice of any 1 of her books (US) or ebooks (INTL) to one lucky reader! You can see the full list of them here. Ends September 7th, 12a EST. Fill out the Rafflecopter below to enter. Please note: As with all Austen in August giveaways, you must fill out the giveaway registration form here in order to enter. This only has to be done once, and then you are free to enter all giveaways. Invalid entries will be deleted. Please do not leave any sensitive info or email addresses in the comments! Thanks! Even with the excerpt, I'm having difficulty imagining Darcy as a pretend pirate, but maybe the book will convince me! I must say that my first thought at reading the synopsis was: Hey, that reads like "Pride & Prejudice" meets the dread Pirate Roberts... ermm "The Princess Bride", that is. Gerd, you have to go out and read this review! She had the same thoughts as you did! Thanks for your endorsement, Ceri! I hope you'll enjoy my others that you might choose to read, and good luck in the giveaway! Pirates + Pride and Prejudice = perfect combo. It seems so funny, especially when you think about Darcy living among pirates. On a boat. In the middle of the sea. I'd be glad to discover Kara Louise and ... It would be my first « austenian » (is it the proper phrase?) novel ever! :). Thank you for this giveaway :D.
Aye, ye better be careful treadin' into the sea of Austenian novels - thar will be no escape fer ya! Ye read one an' ye gotta read 'em all. Seriously, good luck in the giveaway! You can pick any of my books that you like if you win, Vesper! Good luck! I've read Kara Louise's Darcy's Voyage and Only Mr. Darcy Will Do (fab reads btw) so I'd love to read Darcy as a Pirate. That excerpt is exactly how I'd picture the transformation process to go, but I think he could pull off the some of the inner traits to being a pirate captain. Sophia, I do hope you have a chance to read it! Good luck in the giveaway! Pirates and Prejudice was a really fun read! I've enjoyed all Kara's books I've read so far. Been wanting to read Master Under Good Regulation for the longest time, so I would choose that one. Monica, that book has a very special place in my heart. Good luck in the giveaway! This sounds awesome!!!! As a kid I use to love pirates movies like The Black Swan, The Spanish Maine, and so many more. My mom was a big fan of Maureen O 'hara so I watched all her movies. The synopsis of this reminds me of those and I would love to read it. Who doesn't love a pirate? And I love Maureen O'Hara, too! :) Good luck in the giveaway! 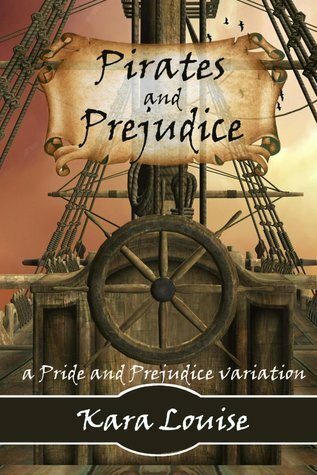 I really enjoyed Pirate and prejudice, i have read the book twice. Soooo glad you enjoyed it enough to have already read it twice! Hope you'll read it several times more! I love stories with Darcy and Lizzy on the ocean! Looking forward to imagining him as a pirate. I'd pick Pirate and Prejudice, as it is the only book of Kara's I've yet to read. It's nice to meet a fan who has read all my books! Good luck in the giveaway! Darcy as a pirate? This is a new facet to Mr Darcy since I heard about Pirate and Prejudice some time ago. As I already own the copy, I would love to win another title but I can't make up my mind yet. Most likely I'll choose Master Under Good Regulation since I heard quite a number of fans praising the book. I think MUGR would be a good choice, but if you win, you still have time to decide. Good luck! And it was also a guilty pleasure writing the book! Good luck! I'd pick this one! It looks hilarious, and the excerpt was definitely funny. And trust me, it's not all hilarious - there are tender, romantic moments as well (and a little swashbuckling!) Good luck! I can guarantee there are no "Arrrrs" in my book, not by Darcy or any other pirate. But there is plenty of other pirate talk! Good luck in the giveaway! I'm anxious to see who wins and which book they'll pick! Good luck! I think it sounds like such a fun idea for a story. I look forward to reading this. I think readers to find it to be fun! Good luck in the giveaway! Pirates and Prejudice sounds like a great read! I'd pick that one. Pirates and Prejudice sounds interesting (uptight Mr. Darcy gone rogue...) so I'd have to choose it if I won. And uptight Mr. Darcy gone rogue was fun to write! Good luck in the giveaway! Wow! I love your excitement! Good luck in the giveaway! I agree. Darcy sailing the high seas looking for love as a pirate?!? Sign me up! I am actually surprised no one had done it before. Good luck! Glad to oblige you! Good luck in the giveaway! Pirates & Prejudice, I don't think I've read a pirate book so it sounds intriguing. Thanks for entering, Tammy, and good luck in the giveaway! I absolutely loved this book! Mr Darcy made a wonderful pirate!! Well, I'd take the pirate book. I read Only Mr. Darcy Will Do and enjoyed it a lot. Hopefully I'll have the chance to read more of your books. Hopefully you'll enjoy Pirates and Prejudice as much as OMDWD. Good luck in the giveaway! Kara Louise is a total fave for this reader! ps= pinned to my JA board HERE Mateys! I'm thrilled you can envision Darcy as a pirate, Rebecca! Good luck in the giveaway! I thought he would, too! Good luck in the giveaway!